Share in key events for material educators, joining two days of talks, discussions, a social program, and poster sessions. Two Materials Education Symposia, held next Spring, will focus exclusively on undergraduate materials education across engineering, design, and science. The advisory committee have just announced this year's themes (below), and are making a Call for Abstracts. These will be reviewed for inclusion as either posters or presentations. Photo: Prof. Mike Ashby thanks participants from 26 countries for their contributions to the 3rd International Materials Education Symposium earlier this year. 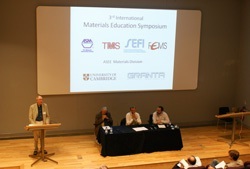 These events for materials educators follow on from the success of the 2011 Symposia: over 150 educators from 28 countries took part in the two 2011 events coordinated by Granta Design and supported by FEMS, ASM International, the ASEE Materials Division, SEFI, TMS, University of Cambridge, and Worcester Polytechnic Institute. Delegates praised the extended opportunities for discussion, the exchange of ideas, and for sharing experiences related to materials teaching. Many left with a renewed enthusiasm and plenty of practical tips to support their teaching. Read the reports here. 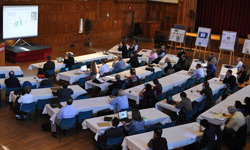 Photo: Educators from across North America joined two days of presentation and discussions at the 2nd North American Material Education Symposia at Worcester Polytechnic Institute earlier this year. The advisory committee have now put together the four themes for each two-day event. Abstracts are invited on any of these topics. Presentations should cover innovative and interesting teaching approaches or resources for teaching materials in its widest context—throughout all years of study and across different disciplines. Regulations that impinge on material use: REACH, etc. Visit the Symposia website (www.materialseducation.com) for more information, full details of the call for abstracts, and to register your interest in attending these events. The Materials Education Symposia are coordinated by Granta Design. We hope that the content of this message is of interest and relevant to your position in materials education. To request that you receive no further unsolicited e-mail messages from Granta, please send a message to news@grantadesign.com with the word "Unsubscribe" in the subject line. International HQ: Granta Design, Rustat House, 62 Clifton Road, Cambridge, CB1 7EG, UK.